The garden at Si Roland Richardson's studio. I am always on the lookout for shore excursions that go beyond the norm and which are culturally enriching. For the most part, such shore excursions are within the province of the premium and luxury cruise lines. However, on a Carnival Journeys cruise, I found one in St. Maarten. 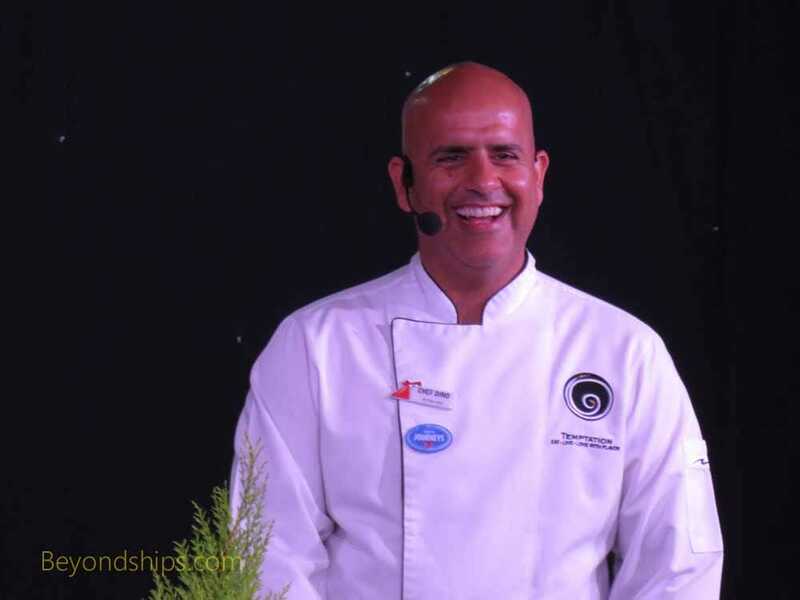 This shore excursion was conceived by Chef Dino Jagtiani to showcase some of the culture of his island that is not normally seen by visitors. Chef Dino was the first person born on the island to graduate from the Culinary Institute of America. His Nouveau Caribbean cuisine has won several prestigious international awards and been the subject of articles in publications such as the Washington Times, the Miami Herald and National Georgraphic Traveler. Chef Dino joined the cruise at the port of call before the ship arrived in St. Maarten. On the following sea day, he gave a cooking demonstration that was open to everyone on the ship. In addition, guests dining in the main dining rooms that night were able to order the dish that Chef Dino prepared at the cooking demonstration. One of the reasons Chef Dino flew out to the ship obviously was to promote the shore excursion. However, the excursion had already sold out before Chef Dino set foot on Carnival Vista. The shore excursion was in four parts. To begin, there was a drive around the northern half of the island. This was conducted by a tour guide who called herself “Shy Jasmine.” Her commentary was energetic and upbeat. It provided information about the island, which was good for first time visitors, but was humorous enough to keep people who had visited the island before interested. Traveling to the French side of the island, the first stop was the vendors' market in Marigot. There, we were met by Chef Dino, who showed us where he buys the indigenous Caribbean ingredients that he uses in his cooking. He sliced samples of pappia, pineapple and mango from the Dominican Republic. We also saw plantains and sweet potatoes with white flesh. Chef Dino said that he wanted to show the visitors the difference in taste that comes from using local fresh ingredients in season. Chef Dino then departed in order to prepare lunch for the group at his restaurant Temptation. While he was doing that, the group would visit Sir Roland Richardson, the island's best known artist. 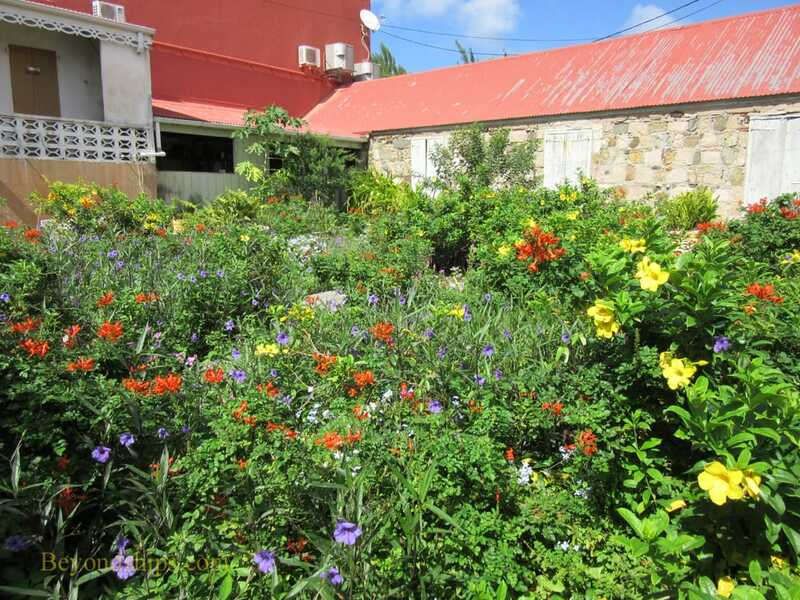 The Sir Roland Richardson Gallery and Museum was only a few streets away from the vendors market in downtown Marigot. It is housed in a building dating from 1847 and is part of a compound that dates to the 1700s. Sir Roland met the group in his garden in the center of the compound. He explained that the garden was designed around the three primary colors - - yellow, red and blue. Color is a central focus of Sir Roland's art. It allows him to capture light, rendering the intangible visible. A revealation of the divine. The paintings on display in the gallery were full of lively pale colors, somewhat reminiscent of the works of Claude Monet, but done in their own distinctive style. Sir Roland pointed out that the light in the Caribbean is yellow whereas the light in France is white. Although color is a central interest, Sir Roland also does etchings and charcoal drawings. Such black and white media provide a different means of capturing light. All of Sir Roland's works are done from directly life. “If I'm not looking at it directly, I didn't paint it.” Indeed, on Sir Roland's easel was a portrait still in progress and patiently waiting for the group to leave was the man whose portrait was being being painted. Because he works from life, he does not have to invent his subjects and can concentrate on observing the true beauty of the subject. Visiting Sir Roland's gallery was a unique experience, not just because it provided an opportunity to see his work but because he was able to articulate the concepts behind his works. Next, we boarded the tour bus for a drive back to the Dutch side of the island and our lunch at Chef Dino's Temptation restaurant. On the way, we passed through neighborhoods where celebrities such as Donald Trump, Diana Ross and Harry Belafonte have houses. The restaurant was located near Mullet Bay, not far from St. Maarten's international airport. It is housed in a modern building and has an upscale sophisticated decor. The meal was three courses. However, before the first course we were served a delicious rum drink made with fresh pineapple and perhaps mint. The first course was a dish that centered on stewed conk balnced with avacado and saffron rice. This was followed by curried chicken with white rice and fried plantains. Both dishes were somewhat spicey but mild enough for the general public. At the same time, the flavor contrasts were subtle and interesting. For dessert, Chef Dino presented a dish with a small chocolate cake, a white chocolate panocotta and a puree of pineapple - - sweetness contrasted with tartness. This was not a heavy meal. It was satisfying but not overpowering. We had three tasty courses but did not feel stuffed. Chef Dino came out and spoke on an individual basis to the members of the group. The final part of the tour was a lesson in how to play the steel drum. This was given by Dow's Musical Foundation, an organization that teaches music to some 750 students on the island. The lesson took place in a commericial building outside of Philipsburg. The room must have contained some 50 steel drums (also known as steel pans). At first glance, they all looked similar but we soon learned that they were tuned to different notes and had different voices. We were told that the steel drum was invented in the 1930s in Tinidad. They are made from 55 gallon oil drums. The larger the skirt of the instrument, the deeper its register. The instructors patiently attempted to teach the group the song “Hot. Hot, Hot.” Some of the participants were much better at it than others. Nonetheless, it was a fun experience. This shore excursion allowed the participants to experience the food, art and music of St. Maarten. It was not a comprehensive look but rather a glimpse of some of its finer examples. Although I have been to St. Maarten many times, the tour gave me a fresh perspective.